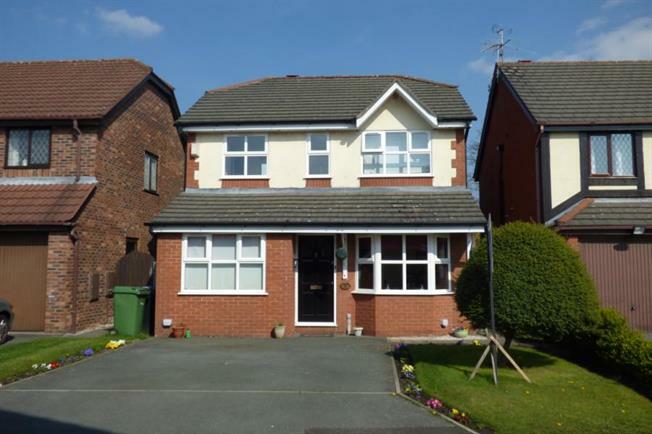 4 Bedroom Detached House For Sale in Warrington for Offers Over £250,000. There is something very special about this wonderful family detached home which boasts a beautiful private established garden and is offered on a FREEHOLD basis, it also enjoys a well appointed and versatile layout with up to five bedrooms on offer by way of the garage conversion which would be perfect as a teenagers bedroom or even an elderly relative. The living accommodation offers three ground floor rooms in addition to the breakfast kitchen of which all are accessed via the attractive hallway which comprises of a wonderful formal lounge which enjoys views over the private garden, a separate dining room featuring an attractive bay window and is positioned to the front, and the former garage which has been converted to another reception room and is currently used as a family room. The kitchen offers a comprehensive fitted suite with room to accommodate a breakfast table and allows access to its own utility room via an archway. The first floor boasts four generous bedrooms of which three are double bedrooms with a fourth single bedroom and all are presented with crisp white finish, the likes of which are found on new build properties, and the master bedroom having access to its own shower room. A family bathroom serves the remaining bedrooms and enjoys a side window providing plenty of natural light. Harrogate Close is a small modern development located of the established Burtonwood Road and has always proved to be very sought after due its proximity to both Westbrook and Gemini shopping centres and is only a very short drive to the M62 motorway network making it perfect for commuters.